I’ve been using the beta web service Spotify for a couple of months now. And I must say that I’m really impressed. I would almost go as far as to say it’s the best piece of software I have ever used. Spotify is a music player that allows you to play music from the Internet without any restrictions. Here’s how they describe it at spotify.com. Spotify is a new way to enjoy music. Simply download and install, before you know it you’ll be singing along to the genre, artist or song of your choice. With Spotify you are never far away from the song you want. There are no restrictions in terms of what you can listen to or when. Forget about the hassle of waiting for files to download and fill up your hard drive before you get round to organizing them. Spotify is instant, fun and simple. Essentially it’s all about playing music and to share songs and musiclists with others. At first glance it looks a lot like a slimmed down iTunes. It’s a simple and functional interface but still visually compelling. I find it very intuitive and easy to use. It simply enables me to what I want to do with minimum effort. If you create a new playlist on one computer it pops up in other computers that runs your account. But you can only play music on one computer at a time. If you start playing at another computer the music stops at the first and a message is displayed. Nice, unobtrusive and easy to understand! One cool thing with it is that you can easily share music and playlists with others. This is something that I find very nice since it makes me discover new great music. I’m astonished by the speed of the application. Even though it’s a Web based software it responses immediately, like if the songs were on my computer. Spotify is free to use, but then it plays a commercial every five song or so. To get rid of the commercials you can either pay 99 SEK per month (about 10 Euro) or buy a daypass for 9 SEK (about 1 euro). 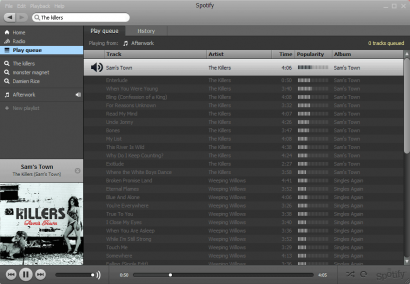 I can’t help but compare Spotify with iTunes. Even though iTunes is packed with a lot more features it’s much more intrusive and above all, slower than Spotify. Why is it that iTunes is so much slower playing and displaying music on my harddrive than Spotify, doing the same with stuff from the Internet? This leads me to believe that the responsiveness of an application is one of the most important factors for how much we appreciate it. I think the reason that I like Spotify so much is that it supports me so well in the things I want to do with music. It let’s me explore music and helps me find new music that I might like. It let’s me share music with others. I can’t see any reason that Spotify wouldn’t be a huge success. I think it’s one of the best software I have ever used and I highly recommend it. Now I’m just waiting for a mobile version so that I can use it on the go as well. Neat, I’m testing the Mozilla’s Songbird for now and it works just great too. One thing I can observe just thru the sshot is: Apple really got really right at the “brushed” theme, specially for iTunes that got spread to many nu-music players. Thank god Songbird has theme support! Jan: I’ve never heard of Songbird before. It looks cool, I got to try it out. Thanks for the tip! I was very impressed with your post; unfortunately, the only way to try it for me is getting an invite from a friend using the service. I’m glad you liked my post though. I think it’s possible to register on a waiting list, but I’m not sure what the URL is. When spotify for iPhone reach the market it’s the death for iPod. I just use deezer.com All free, browser-based (no crappy download), and no invite required. I’m not sure if it’s available in the states though.